Treatment administered in the first 24 hours is the most important determinant of long-term recovery from an acute ankle sprain. Chronic or recurrent ankle sprains also need physiotherapy rehabilitation to achieve stability and should be treated as soon as possible by a physiotherapist to improve stability and decrease pain. Recurrent ankle injuries are unfortunately far too common and the two main factors leading to recurrent or chronic injuries are poor proprioception (including balance retraining) and stiffness of the talocrural (dorsiflexion and plantar flexion movements) and subtalar (eversion and inversion movement) joints. Proprioceptive retraining, or balance retraining, should commence as soon as practical following an acute ankle injury and exercises should be continued for at least 8 weeks’ post-injury. If proprioception is not retrained, the patient will be at high risk of recurrence and can eventually develop chronic ankle weakness and instability. It can take up to 9 months for the ankle to regain full strength and balance following a moderate injury. Severe swelling and bruising following acute injury can indicate either an avulsion fracture or a talar dome fracture. An X-ray will determine the presence of a ligamentous avulsion fracture, but the talar dome fracture (cartilaginous) may not show up on plain X-ray. If the ankle does not respond to conservative management as expected, or if the ankle remains unstable with weight bearing, a talar dome fracture should be suspected and an MRI or CT scan arranged. Large talar dome fractures usually require surgery, with MACI (chondral grafting) now showing excellent results for these cartilaginous lesions. 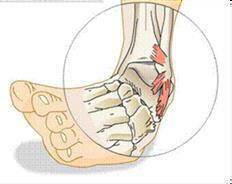 A fracture in the head of the 5th metatarsal is also possible with an inversion ankle injury. These injuries can be easily missed as the patient can be fully weight bearing with only moderate discomfort. More pronounced swelling & bruising extended into the lateral foot is usually seen in these cases.